What Is Your Innate Goal-Setting Style? Setting and achieving goals is a cornerstone of meaningful accomplishment and a great way to transition your motivation into action. However, the MBTI® instrument shows that people go about setting and reaching goals in very different ways. Preferences for either judging (J) or perceiving (P) indicate how we like to organize our world: Js prefer to live in a planned orderly way, making decisions and coming to closure early on, and sticking to a plan while for Ps a lot of this sounds good in theory (and they’ll often learn skills that mimic the behaviors of J’s), P’s actually desire to live in a more flexible, spontaneous way and not limit one’s options. By understanding our own preferences for either judging or perceiving, we can approach our goals in a way that will keep our motivation going, and maximize our ability to succeed by both capitalizing on our strengths and making aware of our blind spots. Is goal completion the end objective? We live in a society that very much favors the judging approach. Americans take for granted that successful people are decisive and stick with goals. We tell our kids: choose your major, stick with it for four years and enter the profession you’ve been planning for since high school. No doubt, this approach would make a lot of parents very happy, and it certainly has clear advantages. Those with J preferences tend to set goals early, jump right into projects and quickly begin to get things done for good reason–their best energy is in the beginning, and that’s when they’re most effective. The fact that the rest of us (Ps) feel like we have to take the judging approach isn’t always a good thing. Our school system teaches students to act like Js, and so you’ll often come across people who are actually Ps, but have learned how to act like Js in order to get approval from parents, teachers, bosses, etc. And most of us, whether or not we actually act with decisive stick-to-it-iveness, are under the impression that this is the ideal approach to life. …or is the goal a starting point on a journey? Ps often set goals early in the process too, because they’re expected to. Take a second to think about the pressure to pick a college major as an incoming freshman. In this day and age, we’re asking students earlier and earlier to make decisions about career directions when some have never even been in more than a few part-time jobs, let alone in the workforce at all. 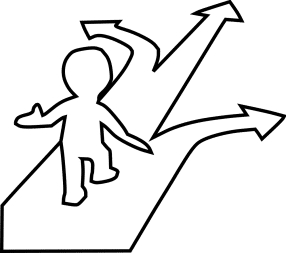 However, those with preferences for perceiving tend to view things like choosing a major not as concrete objectives, but rather as starting points on a journey that may include exploring many options. Along the way they’ll iterate their approach–sometimes to the point where the original goal becomes unrecognizable–because they have discovered a more appropriate goal along their exploration of options. Like Js, they may also jump right in at the start of the project, but not in order to shorten the “action items” checklist. Rather, Ps want to explore options within the goal. In fact, they’ll complete most of the action items near the deadline (it’s a common stereotype that those with a perceiving preference procrastinate compared to those with a Judging preference). While the advantages of this P approach may not be immediately apparent in a J-biased culture, Ps actually work more efficiently and have more energy at the end of the project. That’s when they coalesce all the info they’ve been gathering. Both approaches have their advantages, and both Js and Ps will be at their best when they use their natural style most of time, while also learning to use the strength of the other opposite preference when appropriate to the task or objective (we like to call this flexing your type). J’s may have society and workplace norms on their side, but in some instances they’ll be better served by delaying a decision in order to explore options more fully. By doing this, they’ll avoid getting stuck in something that turns out to be less than ideal for them–be it a career, relationship, college major, etc, because they hadn’t fully explored their options before making a firm decision. And, when they do set goals, a wise J will also learn to be OK with changing direction as evidence begins to emerge that the original goal will be even better if they modify it (or even totally change it), as they remain open to new information along the way. Advice to Ps: Don’t fear committing! If you prefer perceiving on the other hand, don’t be afraid to set goals early, even though your natural tendency may be to forestall out of fear of limiting possibilities. Often the mere act of setting a goal is necessary in order to start a productive process of exploring and testing out the opportunities that are available. The fact that you’ve set a goal doesn’t mean you’re eternally wedded to it. However, choosing an initial direction and kick-starting the process will put you on the path toward achieving something good–even though that path may have plenty of twists and turns, and may look very different than the original goal. Originally published by CPP, Inc.
"Birds of a feather flock together" or "Opposites attract"?